Welcome to the fourth installment of the EVE Blog Banter, the monthly EVE Online blogging extravaganza created by yours truly. The EVE Blog Banter involves an enthusiastic group of gaming bloggers, a common topic within the realm of EVE Online, and a week to post articles pertaining to the said topic. The resulting articles can either be short or quite extensive, either funny or dead serious, but are always a great fun to read! Any questions about the EVE Blog Banter should be directed here. Check out other EVE Blog Banter articles at the bottom of this post! This month's EVE Blog Banter comes to us from Manasi of A Mule in EvE. Manasi asks "How do we, EVE bloggers, adapt to changes as they are thrust upon us (speed changes, no more ghost training, all the Dev blogs, etc), or as our lives make playing the game different (more time, less time)?" Here's my attempt to answer question. Life, ever changing, always in evolution. And so it is with gaming. Even more so with EVE. I've been playing EVE Online for almost 5 years now, and over the years so many changes were incorporated into the game that it would most likely feel completely alien if we were to jump back into the game as it was in 2003-2004. And I'm not talking about the content like new ships, new modules, new missions and what not. No, even the way we play the game has changed. Any of you old timers remember the dozens of bookmarks we had per system in order to jump at 0 km near a gate or station. What's truly amazing is to see how much the game has changed and how many of us have stuck with it. We've evolved our gameplay, our interests have shifted from one profession to another. You have to give to CCP the credit they deserve in providing us with close to 2 FREE expansion every year since launch. This has aloud the game, or should I say, the world of New Eden, to evolve graciously over time. In doing so, it's allowed its player base to evolve with the game as well. As I recall, 20% of the players who were there at launch, are still playing the game. And anyone who's been playing for over 2 years will probably be playing it in 10. That's dedication, that's change management. That's EVE Online. But there's another level to this. The personal one. The Real Life side to this equation. When I started playing the game, I was living in an apartment, in downtown Montreal, with no children. Now, I own a house (well a small part as the rest will be the bank's for a number of years still), live in the suburbs, and am a proud father. You can imagine that this change in my lifestyle had a big impact on my gameplay. And it has! Three years ago I played between 20 to 30 hours a week, easily! Today, I'm lucky if I get 10! But my style of play, as well as where and how I get my satisfaction playing EVE has changed as well. Today, the EVE Blogging Community and my involvement as a writer and podcaster makes up for a good part of what I get out of EVE. Now, I can already here some of you say that that's not really playing the game. I'll give you that. But I'm still getting an amazing experience out of it, and whenever I log in, do some trading, get a few missions done, or help out the corp with a mining operation, I feel as though I'm part of different world. Believe me, you don't have to go pew pew and blow up a ship to get that thrill! Congratulations to all the winners. Please email me at CrazyKinux[at]gmail.com if you feel that you'd rather give your spot to another blogger! Otherwise, stop staring at the list and get to your blogs and start posting!!! I'll be adding you to the Pack list later today, as well as the widget on the right column of this blog and in my master Google Reader listing! I finally got my issue of EON sometime last week. I say finally because I'd been waiting for it patiently for quite sometime now, seeing through Twitter that for others, the wait was over. I'm always a little impatient once I know the the latest issue has been mailed and that it's only a question of time before I can get my print-fix of EVE. Those one or two weeks before I see that white plastic envelope in my mailbox are almost heart breaking though. I kid you not! But this was even more so for this 14th issue, since I had written the Fanfest article, and just couldn't wait to see how it had turned out, once Zapatero had sprinkled some of that magic pixie dust with his flashy editing! It is my opinion that I did not wait in vain, and the whole issue turned out amazing! 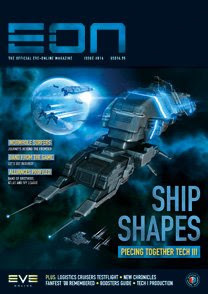 This issue has seen some great contribution from some of the members of the EVE Blog Pack: Zapatero, Flashfresh, Karox Lominax, Winterblink and I. Good work guys! I'm still going through the issue at this moment, and will likely read the Chronicles last, as I like to take them in nice and slow. A quiet evening once all are off to bed, a glass of port or Grand Marnier, and a few hours to dive into EVE fiction! Gives me goose bumps! 14 ---- E-ON Awards 2009 - The Nominees <-- And I'm in a few categories!!! 30 ---- The Party at the Top of the World <-- My Fanfest article!! Sometimes, more often then we'd think, fans make amazing videos. The one below was recently uploaded by KyokoSakoda on to his YouTube account. I just love finding and sharing these little gems, though in this case, this one was unearthed by my mate Ned at CCP. Enjoy! Finding focus. Sounds simple enough. But for someone like me it isn't. You see, I like to know as much as I can. I like to gather a lot of information, which means a lot of links, videos, blog posts, screenshots and whatever else I find on EVE Online. I've been doing this for so long that I just didn't know how to do it differently. I just want to list it all. But being a full time dad, having a full time job, and a well balance social agenda, I've come to realize that I need to make some choices. I need some focus. So. As of tonight, I will refocus most of my efforts on the EVE Blog Community. I'm constantly being asked for advice on blogging about EVE, on various styles of blogging and side projects, and I feel an obligation to answer. It's not only that, but something out of which I get great pleasure in helping out new folks to the EVE Blogging Community. As such, though the Speedlinking posts were great as they were - and a real pride for me - they took way too much time in their current form. I've decided to concentrate strictly on the EVE Bloggers. I'll be choosing 10 articles every week, to showcase on the Speedlinking post. Not 20, not 30. But 10. I'll still cover EVE in the gaming news, but not as part of the Speedlinking posts. This will lead to another change as well. MicroWarpCast had a great beginning. YoMma and I recorded 4 episodes, of which 3 were published. In the beginning I wanted to do a weekly show, then pushed it to a bi-weekly show. Yet, none have been made since. Things needed to change. So in an effort to bring back some consistency to my EVE podcasting, I have decided to record and publish 12 episodes. One each month, published early in the next month. The EVE Blog Banter will continue, and I'll try to have one published before the end of this month. Which doesn't leave much of a heads-up, I know. Still, I want to have 12 banters this year, and I'll have them, even if I'm the only one publishing - which I doubt very much! As for my game play, I've been thinking of changing my playing style for some time now, trying to find something which I can easily do by myself, without having to wait for, or be depended on the corp. After reading the recent Dev Blog, and MalphasWats' post, I've decided to go into exploration. I know that this will be helpful to my corporation, and will be something I can pick up whenever I'm able to login. Which isn't very consistent these days. I grew up watching Robotech during the 80s at the crack of dawn on week-ends, and fell in love with Japanese animation, as well as manga. Some of my favorites are films like Patlabor, Detonator Orgun, Ghost in the Shell, as well as Nausicaä. Each are very different styles and stories, yet all caught my interests. Which is why I was truly excited when I cam across Vexille. And though the story wasn't up to par with the visual quality of this anime, it was still well worth my time! Here's the trailer! Life has mysterious ways of presenting opportunities to you. Sometimes you're going with the flow gaining speed and momentum to get you where you want to go. Sometimes it's as if you're fighting up a raging river in early spring. In late March of last year I hit a speed bump in my professional career and found myself with a lot more time on my hands. Ever the optimistic, I leveraged this opportunity to turn this humble little EVE Online Blog and make it the best EVE blog on the Intertubes! The rest as they say, is history! Let's review the year together and recap the major milestone for this capsuleer blogger. I'm literally floored when I look at the above statistics. Who could have foreseen such results! A lot of work went into achieving these results, and though a lot of that work was done alone, I could not have reached these heights without the help of others. In an effort to get more involved and give back to the EVE community, in early February of last year I jumped at the opportunity to make a fool of myself along with two other EVE players. A new EVE-focused podcast was thus born: The Drone Bay! With the talented and very knowledgeable Crovan as host and editor, and Alsedrech and I as his faithful companions, we embarked on this amazing adventure. At the time, Warp Drive Active was the only running EVE Online podcast, and we saw an opportunity to fill a niche that was void at the time: helping new and veteran players alike. At the time of this writing we've done 17 shows, and though we've done only one since early December, the show isn't dead yet (far from), and we're planning on getting back together to continue the adventure. During the summer months I also had the chance to participate on various other podcast as well, which allowed me to share my passion for EVE and feed my ego ('cause it needs to be fed regularly these days! :p). With short appearances on a few Titan Weekly shows, as well as guest appearances on The Addicted Gamer, Massively Speaking and Aeropodcast, I was becoming more comfortable with the medium and was ready to start my very own show. So, in early October I got together with YoMma, a stranger at the time really & a new EVE blogger, and started Micro Warp Cast. The show got off to an amazing start and was well received by the community. Unfortunately, RL got in the way and though we've recorded a show some time after my return from Fanfest in mid-November, I still have not had the time to finish-up the editing. The good news is that I'm almost done editing show #4 and YoMma and I are about to record show #5. Look for more shows in the very near future! A lot of the success of this blog is result of hard work on my part. Hard and constant work finding new EVE blogs, adding them up on the EVE Blogroll, commenting on a lot of them (as much as I can) and trying to build strong relationships with all these great folks. It's also about monitoring hundreds of other gaming blogs, setting up Google Alerts on EVE related terms, and trying to link to interesting news about the game we play. But that's just one part of this whole adventure. All this effort on my part would go to waste if the EVE Blogging Community was not what it is. I might be the spark that lights the fire up, but if was not fueled and fed by the other bloggers out there, that fire would soon die. These are the folks from the EVE Blog Pack, from the EVE Blog Banter initiative, as well as the friends we have over at Massively, James and Brendan. Having a big heart, I post a helpful article for newbies and for WoW players! I don't know what 2009 holds for me and EVE Online, but if 2008 is any indication, it'll be a hell of a blast! I had an amazing time blogging, podcasting and writing about EVE during the last year. It allowed me to become friends from people all around the world, some of whom I had a chance to meet, and some I hope to meet at Fanfest '09. Though many of you deserve to be thanked for the help and support you've provided me over the years, some rise to the top, and I'd like to mention them here. Thanks to Crovan and Alsedrech for being great Drone Bay co-hosts, thanks to Zapatero for giving me the opportunity (twice) to be part of the EON adventure, thanks to Krystalle, Mike, Shawn, James and Brendan from Massively for all your support and the opportunity you gave me, thanks to Brent from VirginWorlds, thanks to Winterblink for the example you set, thanks to Ned, Misty & Valerie from CCP for your support, as well as all the other Devs for making EVE possible, thanks YoMma for the patience you've shown and the great MWC co-host you are, thanks to SeriousSally and Smakalicious for your link love, thanks to the EVE Blog Pack members, as well as the EVE Blogging Community, for without your continued support all this would not have been as fun as it is! And finally, thanks to all of you for dropping by, leaving your comments, sending emails and simply enjoying this blog.